The Piano Concerto in F was written in the year followingRhapsody in Blue and what strides in confidence and technique Gershwin gained in such a short time. One can tell right from the beginning, with the raw, emphatic timpani thuds that this reading is going to be something rather special. Rhythmic vitality is very much in evidence; so much so that I was completely carried away and could hardly keep still through much of the progress of the opening Allegro movement. Bebbington is alert to all the jazz inflections and syncopations without sacrificing the more classical elements. The music is thrillingly and unusually detailed and nuanced in bright sound engineered by Ben Connellan. On Saturday, high school students across the country will sit down to take a revamped Scholastic Aptitude Test. The new SAT (which looks a lot like the American College Testing exam) will, in most cases, give colleges a tool to help determine whether the student will be accepted to that institution of higher learning. But at Bard College in upstate New York, the SAT carries little weight. “I think both of these tests are ludicrous. They don’t do anybody any good; not the taker, not the college. America is obsessed with these tests. The college rankings are partially to blame for this," said Bard College President. Dr. Leon Botstein. So what’s wrong with the SAT and ACT? “They’re dumb. They are useless. Doing well on a test has nothing to do with learning and nothing to do with being successful in life. It helps you get into college and nothing else," said Dr. Botstein. But not everyone agrees with Botsein. “When the colleges are seeing applications from thousands of high schools , many that they don’t recognize, they need an objective way to compare students among each other," said Eric Greenberg, owner of an educational and tutoring service. "The big picture is that the SAT is changing to look a lot more like the ACT. A lot of people in the field say it’s a response to the ACT getting more of the market share so it’s a business plan," said Greenberg. Christmas, we like to remind ourselves, is about family. But the season tends to offer surprisingly little familial music of any real significance. The subject matter of holiday oratorio, cantata, opera or song tends to be either the Christmas story itself or our own surroundings and issues, whether dreaming of a white Christmas or the jingling of bells or cash registers. Even "The Nutcracker" isn't really family ballet but fantasy. Paul Hindemith's "The Long Christmas Dinner" is exactly what's needed. Completed in 1961, it is the last opera by one of the 20th century's major composers. The English-language libretto, remarkably, is by Thornton Wilder — remarkably because while Wilder may have been a musical connoisseur (he actually directed a Handel opera in 1935), the playwright and novelist was notoriously unaccommodating to composers. He even turned down operatic requests from Aaron Copland and Leonard Bernstein. But Wilder did come around when approached by Hindemith. The result is a wistful, exquisite and profoundly touching tiny masterpiece, which seemed to have no legs whatsoever. The first performance was in Germany, with the libretto translated into serviceable German by the composer. Hindemith conducted the premiere of the original English-language version at the Juilliard School in 1963, a few months before he died, and it was all but forgotten until Leon Botstein revived it last year in New York with his American Symphony Orchestra. Bridge Records has now released a live recording just in time for Christmas dinner. Short and bittersweet, the opera covers a 90-year parade of a Midwestern family's Christmas dinners through the generations. The overture is based on "God Rest Ye Merry Gentlemen," and there are hints of hymn music here and there, but otherwise religiosity is avoided in what is essentially a meditation on the passing of time by two great artists at or near the ends of their long careers (Wilder died in 1975). The entire opera takes place at the dinner table. As the years go by, children take the places of parents, serving white meat or dark. Mindfulness to tradition is attempted as family members record the names of ancestors. But memory fades without anyone quite grasping the process. What matters most, then, is not the Christmas dinner that came before or the one that will come next but an appreciation of the moment. Love and loss, life and death happen quickly, so pay attention. Surprisingly, "The Long Christmas Dinner" turns out to be an opera about the inevitability of impermanence, possibly making it the first and only covertly Buddhist Christmas opera. To do this, Hindemith and Wilder made every condensed musical phrase or line of text have essential purpose. Time flows unstoppably in the understated score, with its subtle pastel instrumental colors and graciously unshowy vocal writing attuned to the sound and meaning of the word. The performance features a young American cast that enunciates clearly if not especially strong on personality. But the orchestra is excellent, and Botstein's account avoids what an older, better-sung German recording doesn't, namely sentimentality. The wisdom of "The Long Christmas Dinner" is that there can be no long Christmas dinners. All happy families are not, as Tolstoy suggests, alike, because happiness, like all else, is ephemeral, So make this Christmas dinner matter. The passage of time is the subject of this lesser-known work by Paul Hindemith. It was his last opera, a thoughtful setting in English of Thornton Wilder’s play of the same name, which sees the Bayard family enjoying their Christmas feast over 90 years. New life is celebrated, old lives commemorated and mourned and the repercussions of decisions are played out over decades. The cast play characters from old and young generations, entering through one door and exiting through another when their time is up. Hindemith’s score works with the cyclical nature of the libretto. Familiar melodies and phrases are uttered by younger characters, echoing the words of matriarchs and patriarchs from years past. The chamber orchestration is expressive yet tidy, never overpowering the soloists and providing a constant stream of accompaniment to the evolving feast. The melodies favour lyricism, rather than the angularity of Hindemith’s early neoclassicism. That said, he’s kept the emotional restraint, so the music never becomes sentimental. With crystal clear diction, the performances by the various soloists are excellent. So too is the American Symphony Orchestra, under Leon Botstein’s secure direction. This is its first English recording, and it’s a fascinating find for lovers of 20th-century opera. HERE'S A WELCOME RELEASE—the first English-language recording of The Long Christmas Dinner, Hindemith’s 1960 opera adaptation of Thornton Wilder’s play, with a libretto by Wilder himself. Although Wilder’s original libretto was (unsurprisingly) in English, the only previous recording of the work is of the German translation Hindemith made later. American Symphony music director Leon Botstein resurrected the original version of this one-act opera last year at Alice Tully Hall for a rare performance, paired intriguingly with a presentation of Wilder’s original play. Bridge Records captured the live performance of the opera in this recording. Like the play, the opera traces the joys and sorrows of the Bayard family over a series of Christmas dinners that span ninety years. Major life events (births, marriages and deaths) are represented symbolically, by the exit of an aging matriarch or the entrance (sometimes immediately following) of a surprisingly ambulatory new mother proclaiming, “Look! Look at my child!” Hindemith and Wilder telescope the fleeting decades with skillful concision, highlighted by the inclusion of several mysterious, shimmering ensemble pieces that specifically reflect on the passage of time (“How long have we been in this house?”). The composer’s cheerfully chugging textures and characteristically pungent, neoclassical musical language are well-suited for capturing the bustle of holiday preparations, yet he manages to tinge even the joyful, upbeat sections with subtly wistful nostalgia. When characters specifically summon events from their pasts, Hindemith provides a distinctive version of Copland-esque Americana that is eloquent but not sentimental. His use of dissonance to signify brooding or impending death is subtle and sure-handed. The high point of the opera is a stunningly beautiful sextet, in which young Sam (the clarion-voiced baritone Jarrett Ott), on leave from military service, tells his family to “Do what you do on Christmas Day.” As the family chats lightly, Sam sings a soaring descant above them (“I shall hold this tight! I shall remember you so!”) to a wondrously vibrant triadic accompaniment. This turns out to have been his requiem; his sister sings a lament for him (“He was only a boy”) before the number has concluded. Written for the concert Mimesis: Musical Representations, performed on October 16, 2015 at Carnegie Hall. This season’s opening concert addresses a basic and persistent question that has remained the subject of endless debate and speculation. The answer remains unresolved and contested, a fact that inspired Leonard Bernstein to appropriate the title of a work by Charles Ives, “The Unanswered Question,” for his Harvard Norton Lectures on music. This concert invites the audience to explore the character of music through the medium of “classical” (or, as Bernstein once put it, “exact”) music written during the past century and a half. The program seeks to inspire each of us to ask: How does music mean? What resemblances or divergences does it have to words and images? What did composers intend to communicate and can we know that from hearing the music? Do we perceive or attribute significance in music differently from previous generations? Is listening, like seeing, a human experience that changes over time, rendering listening as an historical phenomenon? Has something changed over the past century in our perception of the musical experience? The oldest piece in this concert, and its closing work, was written at the end of the 19th century. It is the best known and perhaps the most candidly philosophical work of the four on tonight’s program. Richard Strauss was influenced, as were many in his generation, by Nietzsche’s startling poetic masterpiece, the epic Also sprach Zarathustra (Thus Spoke Zarathustra). Strauss read literature and philosophy closely. His encounter with Nietzsche informed, among other things, his lifelong atheism and his skeptical attitude to an idealistic view of music as a medium of metaphysical truth. Despite his deep admiration for how Wagner wrote music, he remained skeptical about Wagner’s extravagant claims on behalf of music with regard to philosophy and politics. As the famous opening of Nietzsche’s poem (and Strauss’ tone poem) make plain, Nietzsche’s ambition is to force us to fundamentally invert our inherited scale of values. It is not a metaphysical God or the Sun whom we should worship and feel beholden to. Rather it is the Sun who should be grateful to the human individual, for only humans create value and meaning. If it were not for someone to shine on, the Sun would have neither purpose nor meaning. It is not God (our invention), the heavens, or our soul that is of greatest value, but the body, the physical, the time bound, mortal character of real human existence on earth that is our greatest gift and merits celebration. It is we, after all, who have invented the idea of the soul. Our very mortality and earth-bound world permit us to love, sense beauty, and think. The glorious, triumphant, and sensual opening (made famous by Kubrick’s film 2001: A Space Odyssey) of Strauss’ tone poem is not a musical depiction of the sun rising, but is rather the bold expression of an individual imagination that helps vest what we see with a grandeur that is not inherent in what is out there, but exists only in the act of lending experience meaning. What Strauss drew from Nietzsche is the conviction that the making of art, and music in particular, was the highest and most fully human expression of greatness and the most powerful medium by which to define, represent, and conjure human reality and experience. As Strauss traverses Nietzsche’s poem, he displays his unrivaled command of musical thought and sonority to evoke the language, events, and ideas of the text, and to match the poetry with a musical interpretation as moving, beautiful, and dramatic as the literary text itself. Next in chronological sequence is the late Gunther Schuller’s best known orchestral work, the Seven Studies on Themes of Paul Klee. Written in the late 1950s, a half-century after Strauss, Schuller’s concerns were more formalist in nature. Schuller, an eclectic and astonishingly versatile modernist composer, explored the formal parallels between music and the visual arts. By the mid-twentieth century, modernist painting rejected the illusions of visual realism, in which art gave the viewer the sense of seeing some “objective” external reality or seeing how the painter saw external reality subjectively. Consider a portrait, a landscape, or a genre scene. The most aggressive retreat from any such connection between representation and the clearly artificial frame of a painting was abstraction and non-objective art, both of which sought to celebrate the self-referential formal elements of the visual as autonomous and divorced even from an impressionist or expressionist subjective response to the external world. In Klee, Schuller found a painter who sought to do something similar to what modernist composers in the twentieth century hoped to achieve: a distancing from any overt inherited connection between musical rhetoric—the shape of melodies and the use of rhythm and harmony—and ordinary meaning. Music ought not illustrate or represent reality in any manner reminiscent of realist painting. Music had to become free of overt mimesis and create new meaning within the framework of its own elements and practices, using sound, silence, and time. Klee, who was also a fine musician and a devoted listener, found inspiration for his visual creations in music, and Schuller, in turn, took inspiration from Klee’s unabashedly “musical” approach to painting. Henri Dutilleux, one of the great composers of the late twentieth century, in his song cycle Correspondances explores, as Byron Adams points out, not only the link between language and music, but between the visual and music. Using the tradition of speculation about art centered in Baudelaire, Dutillieux also references letter writing. Dutillieux uses music to augment and divert from linguistic meaning and seeks to work out from language. The letter, as a medium, is the most direct form of communication; it is private writing between two people. Dutillieux explores how composed, written music can create sensibilities and meanings beyond the range of words. In letters there is a writer and a recipient: two subjective voices. In music, a unifying temporal frame is created. The writer and reader meet simultaneously, and share in a transformative reading that extends the boundaries of the text. Music neither represents nor interprets the text. Yet it reveals a nascent presence of something in words that without music never comes into being. The descriptive language about the visual experience only deepens the link between music and words. The irony in the title becomes evident. When we write, do we actually correspond, and match our understandings? Does the reading of a recipient match the intentions of the writer? If that is clearly a complex and open question, might one also ask whether there are correspondences between music and words? Last but not least, this first ASO concert of the season presents a contemporary work by a celebrated young American composer, Nico Muhly, whose long association with the American Symphony Orchestra dates from well before he came into the limelight. Muhly’s music explores not only the nature of music, but also its potential connections to reality, to the contemporary social fabric, and the cultural conceits and expectations of audiences. What are the unique possibilities facing new music today? What functions can be ascribed to contemporary music written within the classical tradition in the context of the rich varieties of music that flourish today? Music is not strictly mimetic in the literary sense, particularly as most famously elaborated by Erich Auerbach’s classic book Mimesis. But it is clearly in some sense mimetic of the human experience, of memory, joy and suffering, tied to concrete realities that disappear, fade, and dissolve. Music does so in a manner that neither falsifies nor hides the more familiar physical and historical dimensions of the external world. Music’s temporal nature, its capacity to be remade, reheard, and recreated, its distance from but affinity to the linguistic and the visual, may ironically make it the most profoundly mimetic, with respect to the human experience, of all the arts. In the United States there was once the satellite gap, a purported missile gap, and then the quite real mathematics gap as foreign professors had to be imported to teach in our colleges. There is now a classical music gap as European education at the high school level leaps beyond our lackadaisical contentment with school marching bands. And it is not only Europe, but China, Japan, and even South America now surges ahead of the U.S.in music. Leon Botstein at Bard College has arrived at a modest solution. With assistance from the Mellon Foundation, Botstein has created a new program that connects a two-year high school diploma at Bard’s Simon’s Rock campus in Great Barrington, MA, with Bard College in Annandale-on-the-Hudson, N.Y. Instead of going to the eleventh grade, with the Bard College program at Simon’s Rock students have the opportunity to earn an Associate Degree in two years and a Bachelor of Arts in two more years. The Orchestra Now (TŌN), a unique training orchestra and master’s degree program founded by Bard this year, is preparing a new generation of musicians to break down barriers between modernaudiences as well as the great orchestral music, past and present. Thirty-seven graduate students at Bard's music program (separate from the Bard Conservatory program) will have free tuition plus $24,000 stipend. Final acceptance to the program remains dependent upon an audition. The TŌN Fund will assist students on the graduate level, leading to a Masters of Curatorial, Critical and Performance Studies. The concept of The Orchestra Now will unite performers of varying ages, as in the immensely successful Sistema project of Venezuela, founded by Maestro José Antonio Abreu, whose classical music program has reached about 400,000 students. A national tour of The Orchestra Now, at prestigious venues like Carnegie Hall, will run year-round. Early results from Botstein’s program were on display this past Saturday, September 25, 2015, at Simon’s Rock Campus when thirty-seven students performed a concert program at the professional level with astonishing results. Several players from Bard’s graduate school program accompanied younger players in the program. One aspect of such collaboration encodes the well-known phenomenon that novice musicians usually perform at higher levels when they play with advanced musicians. Joseph Haydn’s Symphony No. 99 began the program with its four movements, stately arriving at an energetic climax. This was the first of Haydn’s symphonies to feature a clarinet and graduate student Elias Rodriguez performed with finesse, yet the orchestra itself was slightly timid. Note the position of the performers on the stage, as this was the format performance layout in the Haydn’s era. Anna Polansky was the featured pianist for Mozart’s Piano Concerto, No. 24. She performed with lyrical grace and nuanced energy as she magically floated the more mystical aspects of the piece floating into the air around us. Here she was ably assisted by graduate student Michael Rau on first violin. Ludwig van Beethoven’s Symphony No. 2 was next on the card. Cathryn Gaylord on bassoon was outstanding and it was clear that the orchestra had well-rehearsed the dynamic contrasts that this symphony demands. The orchestra played with an inspired unity as if they were a single instrument. If anyone had any doubts about Botstein’s ambitious project, here was irrefutable evidence of something amazing. Is the 'Star-Spangled Banner' Out of Place at Orchestra Concerts? The "Star-Spangled Banner" that kicks off opening night concerts across the U.S. is often believed to be a great patriotic tradition. But some people think it's out of place and out of mood. The Fort Worth Symphony recently drew criticism over its practice of playing the anthem before every concert. A Dallas musician sounded off on Facebook that orchestra concerts were not meant to be patriotic events, and that the anthem ruined the mood a conductor was trying to set. Many others agreed. In this week's podcast, two experts weigh in on the anthem at the orchestra. Marc Ferris, author of Star-Spangled Banner: The Unlikely Story of America's National Anthem, says he has no problem with the piece's appearance, which is a holdover from 9/11 in many concert halls. "Just to shoehorn it in there just for the sake of doing it could take away from the thematic program," Ferris said. "But you don't have to do it at the beginning. You could do it after intermission. You could do it at the end." He notes that the first time it was played at a baseball game was during the seventh-inning stretch at 1918 Brooklyn Dodgers game. Leon Botstein, the conductor of the American Symphony Orchestra and president of Bard College, is more ambivalent. "I don't think it necessarily spoils the mood," he said in the second part of the segment. "But to repeat it at every concert is a kind of cheap patriotism. It has, unfortunately, a negative effect. It's like repeating a prayer every day without understanding its meaning." However, Botstein believes the "Star-Spangled Banner" can be effective when American orchestras play it on international tours. He also thinks it provides an opportunity for an otherwise passive audience to participate in a concert. Ferris dismisses the notion that the anthem's octave-and-a-half range and complicated lyrics are overly challenging. "It's a real myth that this is hard to sing," said Ferris. "What, a professional singer can't remember 81 words? We're only singing the first verse." Botstein disagrees. "The 'Star-Spangled Banner' is not a great national anthem," he said. "It happens to be ours. It's slightly unsingable and the words don't really make a lot of sense. But it is our national anthem. If the audience actually likes it, maybe it doesn't spoil the mood." In October, Bard College announced the launch of a new, as-yet-unnamed training orchestra that would be underway by the 2015-16 school year. Yesterday the college announced that 37 students had been enrolled in The Orchestra Now (the "O" carries an accent macron over it, thus TON is pronounced "tone"), which is to be based at Bard and perform in the New York area. TON is a three-year, tuition-free, masters-degree program to be directed by Bard College president Leon Botstein, also a conductor and music historian. According to Botstein, TON's members are "forward-thinking artists who intend to redefine what it means to be an orchestra." They will be learning how to "curate repertoire that engages concertgoers, sparks new ideas, and attracts new audiences," he says. Bard reports it has had hundreds of applicants for the Master in Music Degree Program in Curatorial, Critical, and Performance Studies, as it is called. They hail from corners far and wide, including Hungary, Korea, China, Japan, Canada, and Venezuela. Musicians will not only hone their artistic skills, they will also learn how to be teaching artists for future outreach efforts. In addition to free tuition, which includes health insurance, students will receive a $24,000 stipend. "TON is not as interested in defining itself against New World Symphony or other training orchestras as it is with joining their efforts to address a serious need in American musical training. As far as I'm concerned, there aren't enough training organizations at this level in the United States. Like NWS, TON provides career musicians with the kind of practical experience they would expect to encounter as full-time members of an orchestra." She also mentioned TON's "special emphasis on developing skills in social outreach and audience communication," although NWS certainly emphasizes that as well. Technically, the only quantitative difference between the two would be that Bard's program awards a masters degree. NWS is not a degree program; fellows attend for three years or less. Many have gone on to full-time professional orchestra jobs. TON's 2015-16 schedule includes four concerts at Bard, three with Botstein, one with James Bagwell, who holds the title of associate conductor and academic director; three performances at the Metropolitan Museum of Art, all with Botstein. Free concerts in NYC will be led by Marcelo Lehninger (Bronx); Zachary Schwartzman (East Village); Bagwell (Brooklyn); and JoAnn Falletta (Queens). Though, or perhaps because, he was a very fine amateur musician,Thornton Wilder generally discouraged attempts to turn his plays into operas. But he did write the libretto for one opera, Louise Talma’s The Alcestiad, and agreed to adapt his 1931 play The Long Christmas Dinner as a text for Paul Hindemith. First performed in Mannheim in 1961, it was Hindemith’s final opera. The premiere was given in German translation, and subsequent recordings of the work have all used that version; this is the first disc of The Long Christmas Dinner to return to Wilder’s original English text. Lasting less than 50 minutes, the chamber opera encapsulates the history of a single family, the Bayards, across 90 years, through a succession of Christmas feasts. Characters enter from one side and depart from the other as the decades and the generations roll by. It’s a subtle, wonderfully understated examination of the changing relationships within a family, and of the ways in which society is evolving around them. There are births, marriages and deaths, and finally lonely old age, and Hindemith’s score matches the light touch with which Wilder’s text deals with this complex web of issues. The almost entirely diatonic score is continuous and interlaced with thematic connections, though embedded in it there are also miniature set pieces – a lazy waltz, a whirling tarantella – and the opening prelude is based on the Christmas carol God Rest Ye Merry Gentlemen. A harpsichord gives a vaguely baroque feel to some of the textures, but the orchestration generally allows the voices to carry the narrative, in which the sextet that sends one of the sons off to the trenches of the first world war is the expressive centre of gravity. The performance under Leon Botstein preserves that lightness and subtlety very carefully, and while it’s sometimes difficult on disc to make enough distinction between the characters (there are 11 roles, some of which are doubled here), the basic conceit of the narrative works perfectly. All the performances gel, though Camille Zamora as the two Lucias, and Sara Murphy as Ermengarde, who ends the opera imagining the family continuing without her, are a bit special. 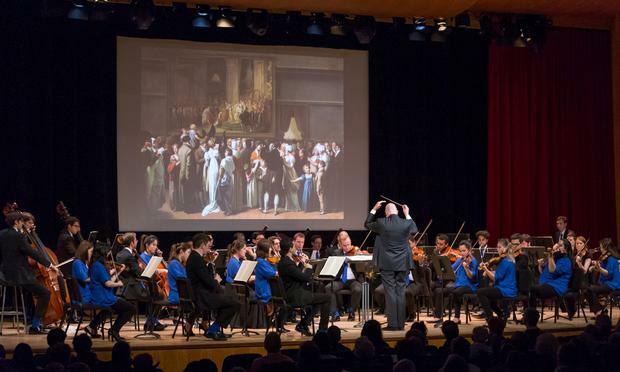 The Andrew W. Mellon Foundation has awarded Bard College a $2 million grant to go toward the launch of an orchestral music program complete with a training orchestra. The program, Master of Music Degree Program in Curatorial, Critical, and Performance Studies, is the college’s inaugural orchestral program at the graduate level, and will be complete with a fully functioning ensemble, made up of select conservatory students, the Orchestra Now (TON). The program will offer students a chance to train in an orchestra that is of professional caliber while earning their master’s degree. The mission, a press release reads, is to “prepare select conservatory graduates for the challenges facing the modern symphony orchestra and to produce scholars and advocates of classical and contemporary music as well as practiced members of a top grade orchestra.” TON students were selected by an audition and academic review process. Graduate students will study three years in the program, where rehearsals will be held four to five days a week while maintaining courses two to three days a week. Courses will be taught by a combination of Bard College faculty, guest scholars, and performing artists. TON, which will offer students the opportunity to engage in community outreach through regional concert series and community music education programs, will be in residence at Bard College. All TON students receive a full-tuition scholarship with an additional annual fellowship stipend of $24,000 and health benefits. For more information, visit www.bard.edu/orchnow.